This Authentic Chicken Parmigiana is about as classic Italian American as you can get. Trust us, take a little extra time, and make the marinara from scratch, as well as the breadcrumbs, and you won’t believe how good this is. Be sure to make the Homemade Marinara, it makes this Authentic Chicken Parmigiana recipe even more authentic! So delicious and makes all the difference!! 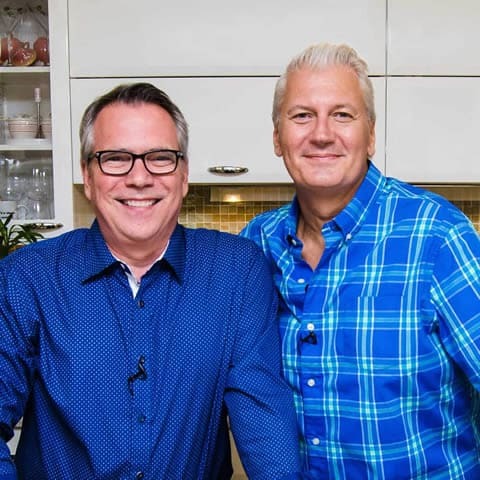 All the other ingredients come together to make one of everyone’s favorite Italian dishes. Oh, how we LOVE this Authentic Chicken Parmigiana recipe! 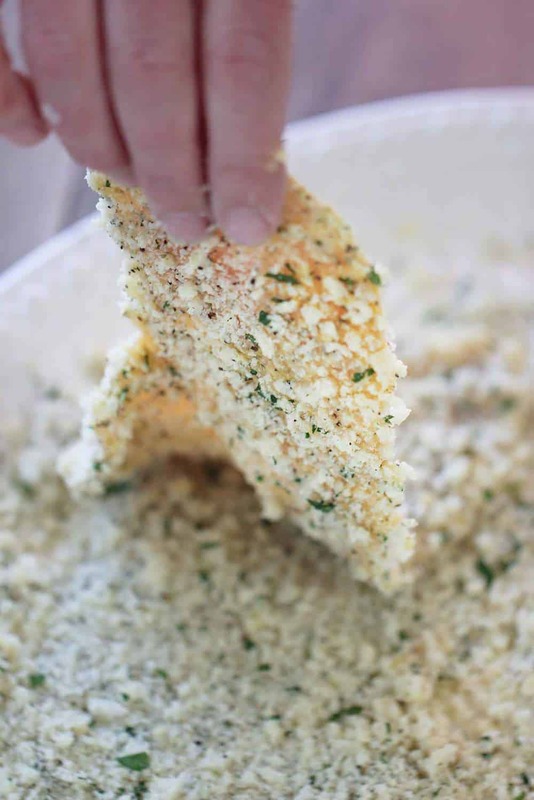 Once you whip up a batch of the incredible and flavorful bread crumbs, you’ll need to set up a little dredge line of flour, then eggs, then breadcrumbs. Don’t forget to use very thin chicken cutlets. Pound them out, if necessary! 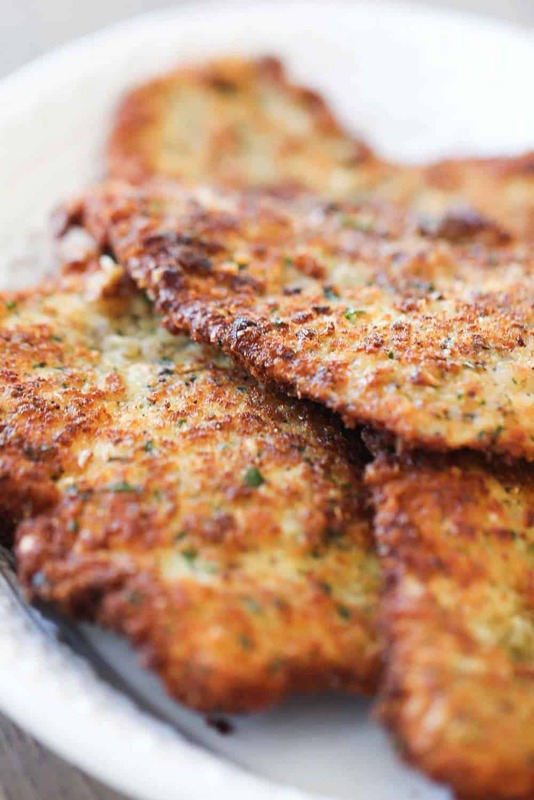 Is there anything much more tantalizing than a platter full of Italian-Style breaded chicken cutlets? I think not! Just look at how yummy these babies are!! Thin and crispy…and loaded with flavor! 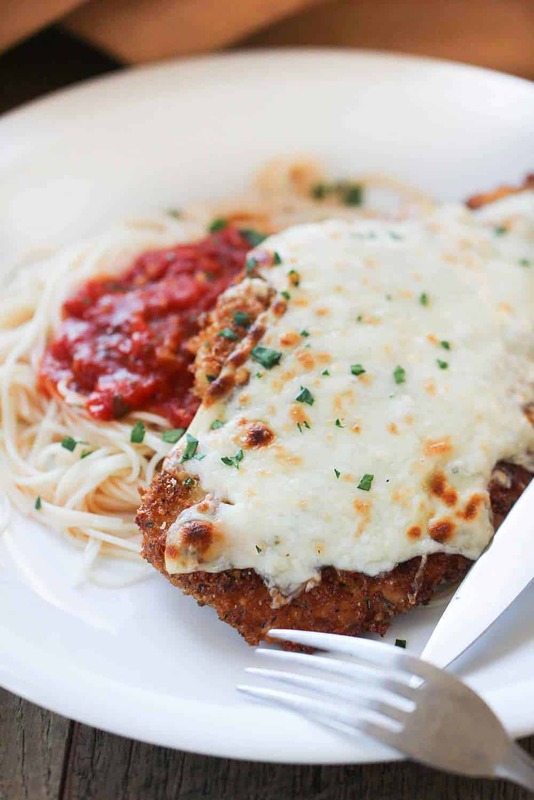 Chicken Parmesan is without a doubt, one of our all-time favorite dishes. 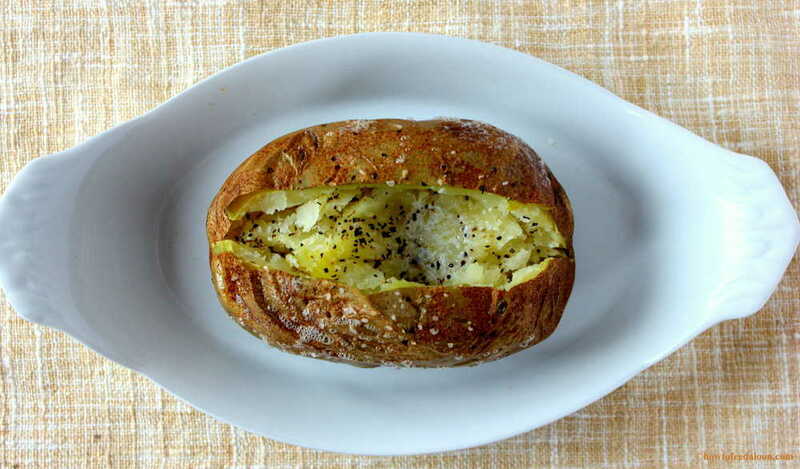 And we promise you, this is as good a version as you’ll, even at your favorite Italian eatery! You’ll take one bite, and yell: “Sorprendente!” Yes! It’s that good! In the mood for another classic Italian dish? You just gotta try this Pasta Carbonara recipe (click link for complete recipe)! Now…let’s make some amazing Authentic Chicken Parmigiana! Go for it, you can do it!! This Authentic Chicken Parmigiana is the real deal. So good. And so classic American Italian. Making this with homemade marina is critical to it's success. Awesome. 2 5 oz. chicken breasts pounded to 1/4 inch thickness between two pieces of heavy duty freezer bag. In a food processor, process the bread until it is coarsely ground. Add the cheese, garlic, parsley, and oregano and pulse until the mixture is finely ground. Season the bread crumbs with salt and pepper and pulse the mixture again until just mixed. Spread the flour on a large platter. Spread the bread crumbs on another large platter, or baking sheet. Coat them with flour and shake off any excess flour. Dip them in the eggs mixture and let excess drip off. Press the cutlets into the bread crumbs, making sure they a fully covered on both sides. Set them aside on a plate, and stick in the fridge for at least 30 minutes, up to 6 hours. Once hot, add the cutlets and cook them for about 8 minutes per side, or until they are a deep golden brown all over. Transfer them to paper towel to drain. 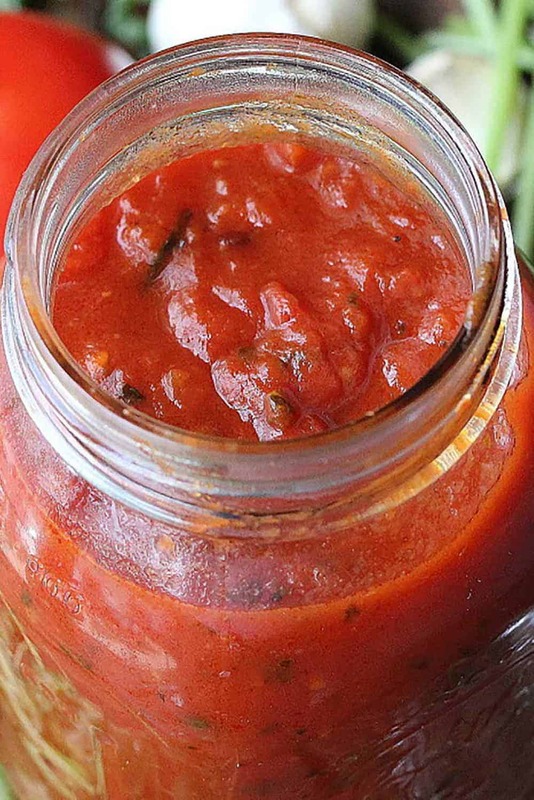 Meanwhile, in a medium saucepan, heat the marinara sauce over medium-high heat for 5 minutes, or until fully heated. Transfer the cutlets to a shallow ovenproof dish (9x13 is good). 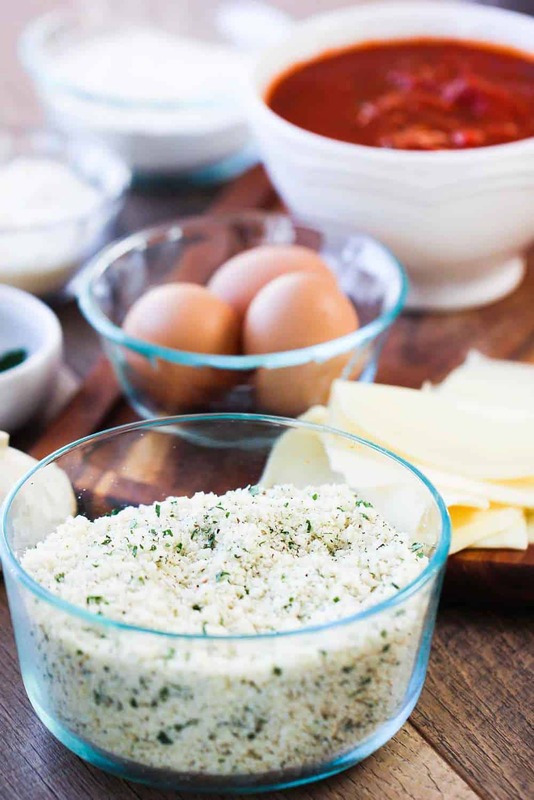 Place the mozzarella on top and sprinkle with grated cheese. Ladle the sauce onto a large platter. Place the cutlets on top of the sauce. Sprinkle a little more freshly cut parsley over the cooked cutlets. As a 100% Italian-American, I can certify that your Italian recipes are not only delicious, but totally authenic! Grazie! Mangia!